What type of pallets does FALM offer? We provide pallets of all sizes. We currently provide pallets up to 26 feet, but it should be noted that larger pallets may cause longer lead times. For more information, contact us. We typically offer Grade A and Grade B recycled pallets. We provide both hardwood and softwood pallets based on your needs. We offer both stringer and block wood pallets as well as compressed wood pallets. We’re also able to provide 2-way and 4-way pallets. We provide both new and recycled wood pallets. We also offer heat-treated pallets and methyl bromide pallet treatment. Our customers typically order 500 or more pallets per month. However, we do handle smaller orders ranging from 200-300 pallets. Contact us to see if we can help you today. How do you handle pallet sanitation? Our suppliers are able to meet all ISPM-15 mandates. We offer both heat-treated and treated pallets. What is the purpose of heat treating pallets? When constructing pallets with green lumber, insects often live in the freshly cut wood. Heat treating pallets raises the temperature of the wood to dispose of any remaining bugs, which prevents them from spreading between companies and countries. Heat treatment is mandated by U.S. customs under the ISPM-15 program. It requires that all pallets that enter and exit the country. How do I know if my pallet has been heat-treated? When you heat treat a pallet, the unique operator number is stamped on the outside of one of the stringers. How much does it cost to heat-treat a pallet? Heat treating prices vary, but typically costs between $0.75 to $1.25 per pallet. Do I need to heat-treat my pallets more than once? Pallets only need to be heat-treated once; however when a heat-treated pallet is repaired with new wood, it must be treated again to ensure the entire pallet is protected against bugs. What are pressed wood pallets? Pressed wood pallets are pallets made with wood chips and glue and have “feet” instead of stringers. They are bug-free and don’t need to be heat-treated, making them an excellent exporting pallet. How do pressed wood pallet prices compare to traditional wood pallet prices? Pressed pallets are cheaper than new stringer and new block pallets and are a slightly more expensive than recycled, used stringer and used block pallets. Do you offer alternative pallet materials? FALM only offers wood and pressed wood pallets. 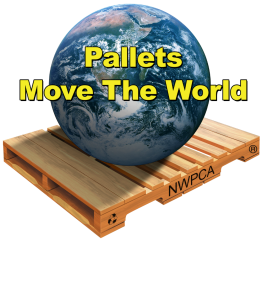 93 percent of the pallets in cycle across the U.S. are wooden. Wood pallets are easier to recycle and repair than plastic or metal pallets, making them a sustainable packaging staple. We’re proud of our green initiatives and are happy to provide our clients with a sustainable way to handle their reusable packaging materials. What is the benefit of using your pallet design software (PDS)? Our pallet design software provides our suppliers with an exact blueprint of the pallet structure needed to support and ship your products safely based on the density of the lumber and the type of load being carried. These blueprints enable our staff to efficiently build durable, reliable pallets that are ready to ship when the time comes. Because our design software relies on unique pallet specifications, it gives our customers peace of mind knowing their pallets are designed specifically for the products they carry. This increases safety during the shipping process and once the pallets are in storage.